Cooler fuel equals denser fuel which can translate into more HP that is available from the engine. Cooler fuel, or a more stabilized temp will assure that as the day gets hotter and the fuel tank volume gets lower, you do not see a decrease in MAXIMUM available HP – Notice I said MAXIMUM HP. Comfort – Imagine having fuel tanks under the floor, especially in a salon area at 140F on a hot summer day. Safety & component reliability and longevity – I doubt you could find a study documenting this, but I’d certainly guess that fuel lines and filters would last longer with 90F fuel passing thru them vs. 140+F fuel running thru them. 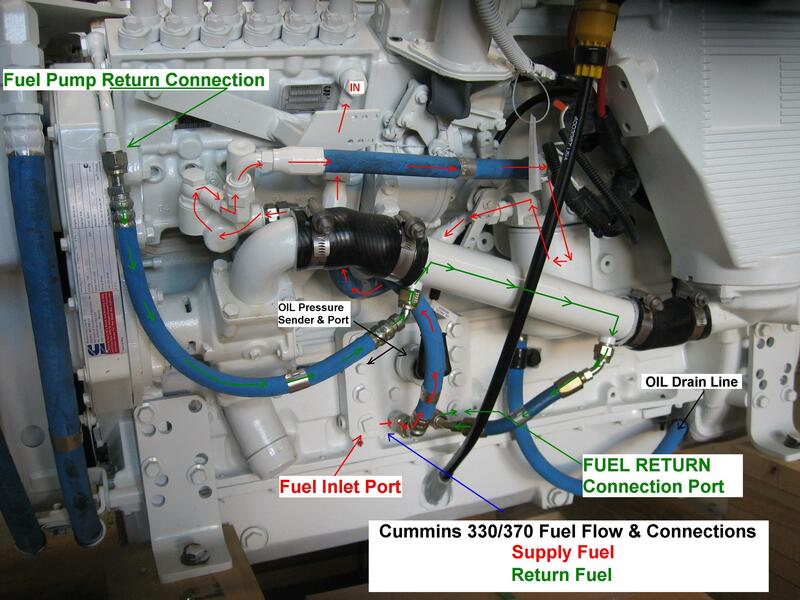 In the case of Cummins Electronic engines & probably some others, (both Common Rail, “CR”, & EUI systems), the supply fuel is used to stabilize or control the max temp of the on-engine ECM – The fuel supply passes thru the fuel cooled heat-sink that the ECM is part of – Liquid cooling per se …….. Cummins has a MAXIMUM SUPPLY temp measured at the inlet of the engine of 140F for their electronic engines (160F for the mechanical engines). That may not sound very cool, but it’s cool enough to ensure the ECM has a stabilized temp below what they want to see to assure longevity. But, since rated HP (WOT, full load) is measured at a much lower temp (maybe 70-80F-ish), I doubt you would achieve rated HP on 140F fuel being fed to the engine. The real impetus to this discussion was about “removing the cooler” and if this could be done. Actually, we remove many fuel coolers on both CR and EUI engines in our work (well over 100 electronic engine installations in the last 5 yrs) and have no issues whatsoever, but you must understand this is 100% application specific. Most of our work is commercially orientated and many of the vessels we deal with have very large fuel tanks (100’s to 1000’s of gallons), and thru normal course of circulation, excess heat is safely and comfortably dissipated thru the surfaces of the tanks (like air cooling or thru conduction & convection). Many of these vessels have integral fuel tanks so a fuel cooler is built into the boat. Think of it like a very large “Keel Cooling” system. I tend to think most steel vessels are built this way regardless of the actual use of the vessel. Just about all of these vessels cruise at very low HP levels in relation to the HP that is available from the engine. Or, we may install an engine with a much lower rating than the recreational equivalent (maybe a QSM that could be rated at 670-715HP, but we install the 350HP version). Example, an engine rated at 540HP, but which cruises at or has extended running never exceeding 150HP (about 7-8 GPH), would never need a fuel cooler for “Horsepower” reasons as this would preclude that the operator would NEVER notice any decrease in HP even if the fuel supply approached 140F. Cummins (and I’d guess most manufacturers) have a max fuel supply temperature NOT TO EXCEED. 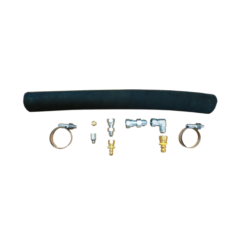 How you control that fuel supply temperature is not written in stone, at least with Cummins as it’s merely a specification or requirement that needs to be met – With Cummins, the fuel cooler option does not have to be included in a factory ordered engine in many cases – It can be left to the OEM or end user to decide how he can meet the spec and the application needs. 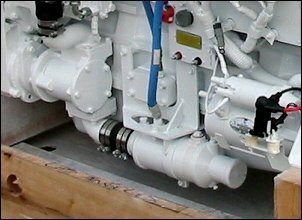 The factory installed fuel cooler for the QSM causes much grief in many installations due to it’s location on the engine. It’s total overkill as to size, and IMO “what were they thinking” comes to mind. Over the years, we’ve seen an extraordinarily high internal failure rate of these coolers as well, which are produced by a New York based company doing business under the name “CHAMP”… Not a good sign!! 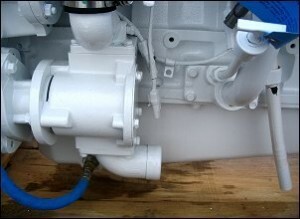 From our point of view, if a fuel cooler is not needed and the engine manufacturer specification for fuel supply temperature can be met under any condition (most adverse or worst case scenario), then remove it and you will also remove unneeded plumbing and hardware from the engine, besides removing the risk of losing a fuel cooler from an internal failure – Yes, we have seen many of them fail, some with disastrous contingency damage to the engine. As to our own Seaboard SPEC – We shoot for 120F as an absolute max in an application where we know it is not needed for any of the reasons mentioned above. 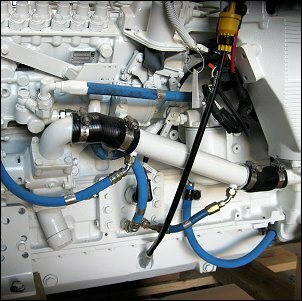 Ponder this regarding the need for fuel coolers – just because a “CERTIFIED” tech or the mechanic you hired has not seen a CR or any electronic engine without a fuel cooler just tells me he has more to learn, and needs to understand just how and why they may or may not be needed. Do we ever leave factory fuel coolers in place? Of course we do, but again, it’s 100% application specific.